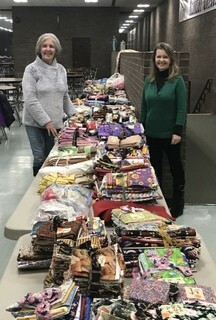 January’s Ugly Fabric Auction was a great success, netting $676 to help support guild activities. Thanks to all who bid and donated! I am pleased to announce that the guild has been awarded a $1,000 grant through ArtsWestchester’s Arts Alive program to help fund our speakers. We are honored to receive the money and are thrilled that ArtsWestchester recognized quilts as an art form. We hope to use this relationship with them to publicize the guild, and help build interest in quilting and increase our membership. Thank you to all who helped in writing the grant application. Now for some not so good news. We were informed several weeks ago by Western Connecticut State University that in 2020 the first weekend in May will no longer be available to us for the quilt show (don’t worry we are okay for this May). They are going to start using the arena on the Friday of that weekend for their sport’s award dinner, which will impact with our set up. 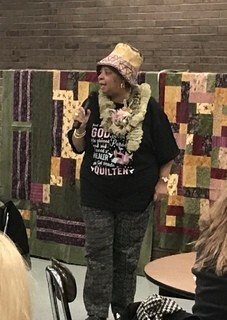 The Board looked at possibly moving the show to another weekend, but found that it would not be possible without conflicting with another quilt show or a holiday. We are starting to examine our options and will be reporting back to you as we develop them. Remember the Challenge Quilts are due this month. I hope we have lots of submissions – it will be great having a large display at the show. Our program will be demos by various guild members and it looks like we will have a good variety of presentations at the meeting. If you have not signed up for Super Saturday, you can still do so. Contact Pooa Bloomberg at Supersaturday@northernstarquilters.com to register. Unfortunately, we have had to cancel this year’s Lancaster trip. We only had 10 people who had signed up and paid by the January meeting. After struggling last year to get enough people to sign up to cover our costs, we decided not to risk losing our deposits and cancelled the trip. We plan on offering it again in 2020, and maybe a year’s hiatus will create more interest. Thank you to Jen Cannizzarro for keeping on top of things so we will not lose any money. Stay warm and see you on February 19.